(1) How do cells maintain protein homeostasis? (2) How do changes in protein homeostasis lead to pathology? (3) Can modulation of protein homeostasis be used to treat disease? Protein homeostasis generally refers to the posttranslational mechanisms that maintain a normal cellular repertoire of functional proteins. It has become increasingly clear over the past decade that protein homeostasis is critical to the health of cells and organisms. Defects in protein homeostasis underlie diseases that afflict millions of people, including cancer and neurodegenerative diseases. Gaining a deeper understanding of protein homeostasis will shed light on how these diseases develop, which in turn may lead to new methods of diagnosis and therapy. Figure 1: Organization of the Ubiquitin-Proteasome System. Ubiquitin is activated for conjugation by E1 enzyme and transferred to E2 (ubiquitin-conjugating) enzyme. From there, ubiquitin is transferred to a substrate. This process is catalyzed by an E3 (ubiquitin ligase) enzyme. In some cases substrates receive a single ubiquitin, whereas in others they receive multiple ubiquitins linked together in different ways. Although the outcome of ubiquitination can differ, proteins that are modified with chains of >4 ubiquitins are often degraded by the proteasome (for simplicity, the figure shows only a single ubiquitin). The number of human genes corresponding to each component is shown in parentheses. The >500 E3s comprise different ubiquitination pathways with distinct functions and specificities. Some mediate quality control of mis-folded or mis-assembled proteins (top branch) whereas others regulate specific cellular processes (bottom branch). A classic example of the latter is the cullin–RING ubiquitin ligase SCFCdc4, which promotes degradation of G1 cyclins while sparing the Cdk subunit. The major effectors of protein homeostasis include factors that mediate protein folding, assembly, and degradation. We are particularly interested in mechanisms that mediate protein degradation. Cells are constantly turning over proteins, making room for new ones. Within cells, the vast majority of protein degradation is carried out by the ubiquitin-proteasome system (UPS)(Fig. 1). Proteins slated for degradation by the UPS are first tagged with the protein ubiquitin by enzymes referred to as ubiquitin-conjugating enzymes (E2s) and ubiquitin ligases (E3s). The ubiquitin tag is subsequently recognized by the proteasome, which is a large proteolytic complex that binds ubiquitin tags and degrades the protein to which the tag is attached. Protein degradation via the UPS serves two general functions (Fig 1), both of which we are studying. The first function is to mediate protein quality control. Proteins that fail to fold or assemble are degraded by the UPS shortly after their synthesis. Five to 15 percent of newly synthesized proteins fail to attain a mature conformation; their degradation is initiated during or shortly following synthesis. This represents a major load on the UPS, and mutations that perturb this process lead to neurodegeneration. The second major function of the UPS is to mediate the degradation of regulatory proteins that control crucial cellular processes. This includes degradation of cell cycle control proteins (e.g., cyclins and Cdk inhibitors), transcription factors (e.g., Myc), and checkpoint control proteins (e.g., p53). Hundreds of proteins that control almost all aspects of cellular and organismal biology are controlled by the UPS, and multiple mutations that perturb this regulatory function have been identified as root causes of cancer. The breadth of action of the UPS in regulating protein homeostasis and eukaryotic biology is enabled by the sheer complexity of the system. More than 1,000 genes encode proteins that mediate the conjugation, perception, or removal of ubiquitin signals. Of these, ubiquitin ligases comprise the largest group, with more than 500 encoded in the human genome (Fig. 1). One of our major efforts is to investigate the biggest family of ubiquitin ligases, known as cullin-RING ubiquitin ligases (CRLs), which we codiscovered more than 15 years ago. CRLs are key regulatory enzymes and are the target both of anticancer drugs and of mutations that predispose to cancer. Our broad range of approaches draws on biochemistry, mechanistic enzymology, biophysics, chemical biology, quantitative proteomics, molecular genetics, and systems biology to study how members of the CRL family are assembled, how they work, how their activity is controlled (Fig. 2), and what they do. Given the major regulatory impact of CRL enzymes, achieving a deep understanding of this family will have a broad impact on our knowledge of basic cell biology of both normal and diseased cells. Figure 2: Control of cullin–RING ubiquitin ligase (CRL) activity and assembly. 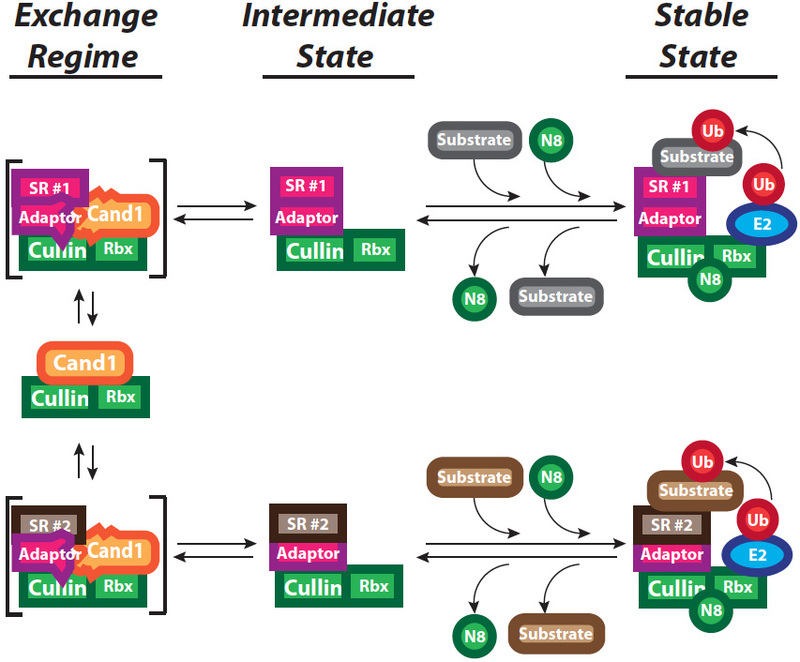 Rapid exchange of multiple CRL adaptor-bound substrate receptors (SR) occurs via the Cand1 exchange regime through the formation and decay of transient ternary complexes shown in brackets. Cand1 and adaptor are drawn as deformed in these complexes, to emphasize our hypothesis that they clash sterically, yielding an unstable state. In the presence of substrates, CRLs that pass through an intermediate state become conjugated with the ubiquitin-like protein Nedd8, which activates the enzyme and blocks binding of Cand1, resulting in a stable state. Loss of substrates facilitates recruitment of the Nedd8 deconjugating enzyme COP9-Signalosome (CSN), which promotes removal of Nedd8, and a return to the exchange regime governed by Cand1. Once ubiquitin tags are attached to a protein by CRLs and other ubiquitin ligases, ubiquitin receptors interpret the signal to effect a specific outcome. A prominent (but not the only) outcome is the degradation of the modified protein by the proteasome. Ubiquitin receptors that act between the CRLs and the proteasome include the ATPase p97/VCP (Fig. 3) and its extensive network of adaptor proteins. The p97-adaptor complexes bind directly to ubiquitin ligases and to ubiquitin-modified substrates and can carry out further processing of the ubiquitin modification. For reasons that remain unknown, p97 is essential for the degradation of some but not all proteasome substrates, including both quality control and regulatory substrates. One hypothesis is that p97 assists the proteasome by extracting ubiquitin-modified proteins from larger structures and unraveling them, so that they can be fed into the proteasome (Fig. 3). Using the range of approaches mentioned above for CRLs, we seek to understand what p97 does, how its activity is regulated, and how it specifically selects its substrates. To assist our studies, we have developed small molecules that inhibit the activity of p97. In 2014, a derivative of one of these molecules entered human clinical trials for cancer therapy, which illustrates how our fundamental investigations of the UPS and its enzymes can be translated directly into medicine. Figure 3: The myriad functions of p97 in protein quality control. P97 promotes proteasomal degradation of substrates in multiple pathways, including several related to protein quality control. Upper left: p97 facilitates extraction of misfolded membrane and luminal proteins from the endoplasmic reticulum. Upper right: p97 catalyzes extraction of stalled ‘non-stop’ proteins from the ribosome. Lower left: p97 disentangles aggregates and disassembles protein complexes to facilitate degradation of subunits by the proteasome. 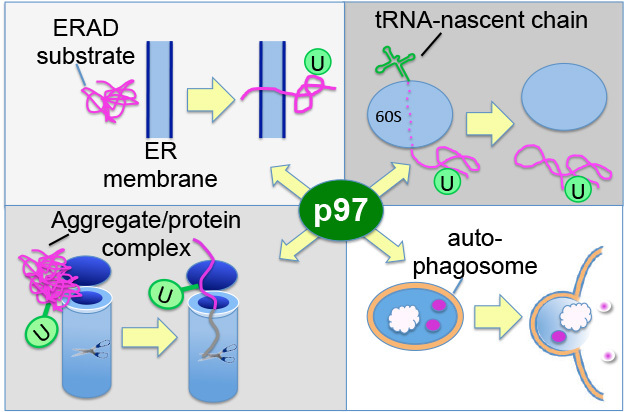 Lower right: p97 promotes degradation of proteins via autophagy by promoting autophagosome maturation. Once p97 has acted upon a substrate, it can be degraded by the proteasome. There is much we do not understand about the mechanics of this process. We seek to develop new assays, methodologies, and tools—including novel small-molecule inhibitors—that will enable us to dissect the mechanism of proteasome activity and its regulation.